This event took the form of a panel and audience discussion, highlighting perspectives from countries and support agencies on the formulation and implementation of the NAPs process, and providing an outlook on future needs. Panelists shared their experiences with developing NAPs and the obstacles they encountered, and explored opportunities to mobilize funds for NAP organization and implementation. Abias Huongo, Chair of the Least Developed Countries Expert Group (LEG) began the session by providing the perspective of the LDCs, who emphasised the necessity for working on NAPs and have generated positive forward momentum. He said, "There are notable areas for improvement in the NAP process, such as the need for funding partners to support the entire process with the mobilization of funds, rather than directing their attention on individual sectors." Clifford Polycarp of the GCF Secretariat gave a brief presentation on support for adaptation planning and programming, modalities to access GCF funding, and the readiness and preparedness support for NAPs, with the objective of providing countries with a better sense of what is available from the GCF in adaptation planning. Mr Polycarp clarified what the GCF is doing to implement programs that have already been financed. He said, "Modalities from the GCF have been provided in a flexible way, with up to $3 million USD available per country." Mr. Polycarp provided a brief overview of the process of reviewing readiness proposals, and a summary of what criteria the GCF apply when assessing proposals. The criteria includes the impact potential, sustainable development potential, efficiency and effectiveness of a project. Mr. Polycarp concluded by clarifying that according to the GCF’s allocation targets, about half of the total GCF portfolio is intended for mitigation and half for adaptation projects. Within the adaptation portfolio, about half of the financing is allocated to SIDS, LDCs, and Africa. Norbert Gorrissen, Head of Climate Change Finance - International Climate Initiative at the German Federal Ministry of the Environment highlighted what Germany is doing to address adaptation. He said, "Germany has substantially increased their financial support in recent years, from $400 million to $1 billion, with a goal to scale up to $4 billion by 2020. Germany supports NAPs-related projects on the global, regional, and bilateral levels." Rawleston Moore, GEF Secretariat, gave an update on the support the GEF providing for NAPs. 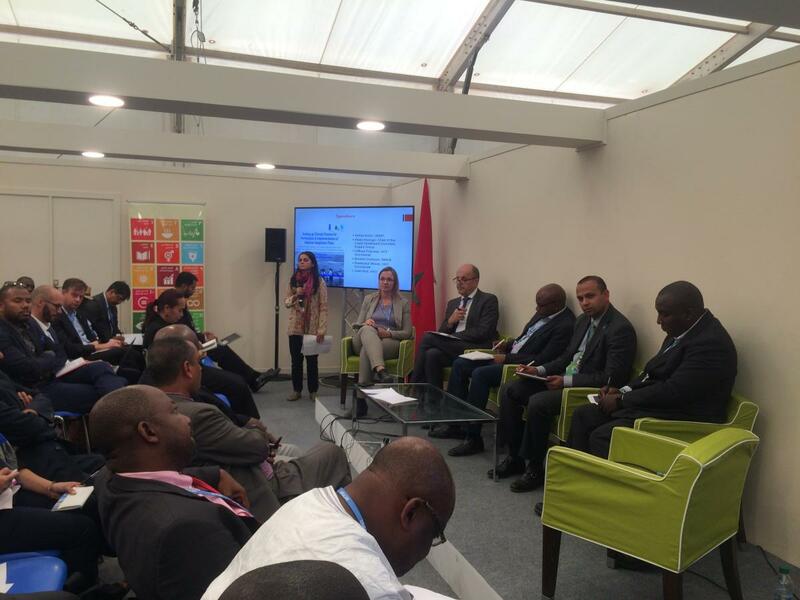 He noted, "The location of COP22 in Marrakesh is appropriate because it’s the same city where much of the work around the LDCF began, which has been the primary vehicle through which the GEF has funded its adaptation activities." The GEF has recently approved three projects which are focused on NAP in Chad, Malawi and Senegal, and has a few more in the pipeline. Julia Wolf from the FAO concluded the first panel. She said "It has been encouraging to see changes in opportunities for the integration of agriculture since Paris. There is more attention being paid to agricultural issues now, with 131 out of 189 countries including adaptation and agriculture as priorities in their NAPs." The second part of the session focussed on a panel of country represenatives who reported on the implementation of their projects. Benjamin Karmorh from Liberia spoke about how Liberia addressed gaps in their NAP process. He said, "Our NAP process in Liberia began in 2014, and included a national stocktake exercise supported by the NAP-GSP which allowed us to identify critical sectors such as health and agriculture, which are both critical to development and in need of ongoing support." Luisa Tuiafita from Tonga outlined her countries unique approach to the NAP process, known as the JNAP (Joint National Adaptation Plan). 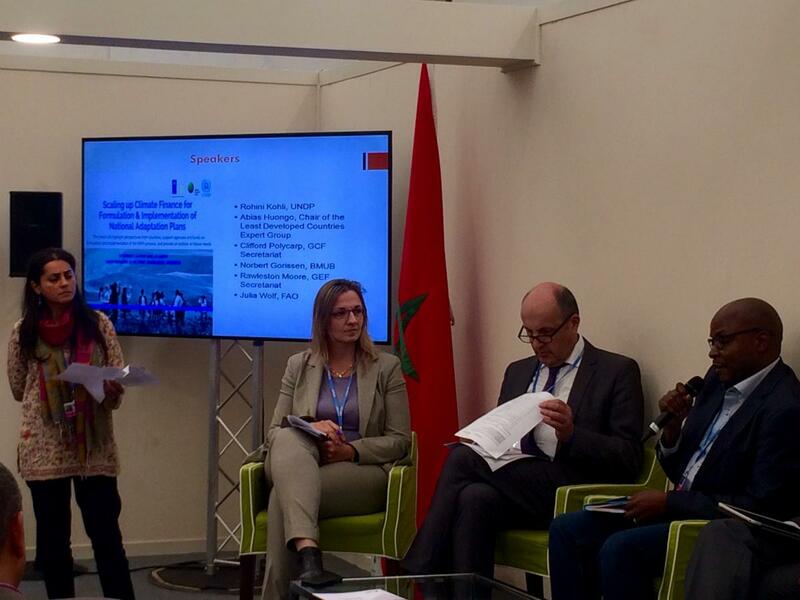 Ms. Tuiafita reiterated a recurring theme throughout this event and others at COP22 - the need for specific, accessible scientific information when designing and implementing effective adaptation plans. Kollawat Sakhakara of Thailand spoke briefly about Thailand’s use of complementary sources of funding to move forward with projects, and Naresh Sharma of Nepal noted the urgent need to coordinate NAPs with diverse sources of financial support. 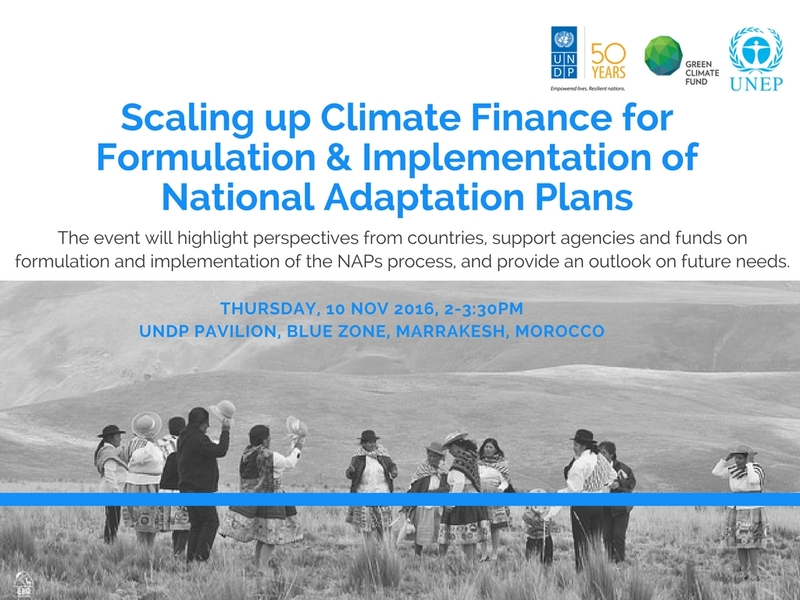 The event was closed with remarks by a UNDP, emphasising that the NAP process can support implementation andinvestment in scaled-up adaptation actions. The process presents an opportunity for engaging stakeholders and private sectors, providing a tool for coordinating efforts towards a common vision and action plan.